Beautifully Hand crafted Three metal healing bracelet with turquoise, coral lapis inlayed Fits both men and women. 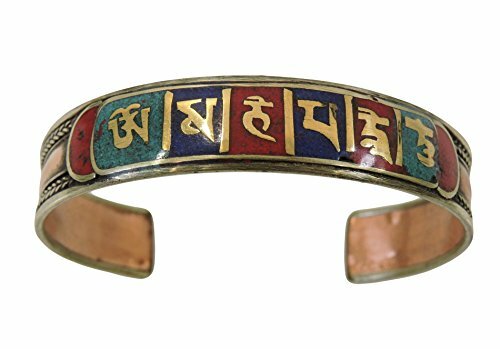 It has open back for adjustable size - one size fits all -The sacred mantra reads, Jay Ganesh, Om Mani Padme Hum, Om Tare Tutare Ture Soha, Jay Matadi, or Om Namashiva in Hindi or Sanskrit script. -It is said that this formula of 3 metals can be worn on the body for general healing, balancing of essential energies, strengthening Qi, increasing circulation, regulating blood pressure, & relieving pain. Bracelets made from copper are commonly used to relieve symptoms of arthritis, rheumatism, tendonitis, and carpal tunnel syndrome. -Comes with Silk Pouch - makes a great gift -Hand Made in Nepal. If not polished, it may tarnish. The best way to treat the bracelet if it tarnishes is to brush it with a toothbrush and some toothpaste. Dry it with a towel after rinsing it. When the bracelet is completely dry, please apply clear nail polish all over the bracelet. The bracelet will not tarnish after this treatment anymore. rheumatism, tendonitis, and carpal tunnel syndrome. -Comes with Silk Pouch - makes a great gift -Hand Made in Nepal. If not polished, it may tarnish. The best way to treat the bracelet if it tarnishes is to brush it with a toothbrush and some toothpaste. Dry it with a towel after rinsing it. When the bracelet is completely dry, please apply clear nail polish all over the bracelet. The bracelet will not tarnish after this treatment anymore.